Guy Fieri at the 2019 Disney California Adventure Food & Wine Festival! A little heat, a little rock ‘n roll and a whole lot of fun occurs as Celebrity Chef Guy Fieri cooks up excitement on the Palisades Stage. Watch as Guy Fieri lights up the night in a fun, 60-minute live presentation that includes demonstrating a few of his favorite dishes. You’ll also learn how Guy got his start and how a pretzel cart was key to his future success. Following the presentation, you’re invited to attend an after-party at Paradise Garden Grill where you may sample a few of the dishes prepared on stage. Ticketed event Guests may enjoy a complimentary cocktail or non-alcoholic specialty beverage as they enter the seating area. Additional beverages will be available for purchase. Guy Fieri, chef, restaurateur, New York Times bestselling author and Emmy Award-winning host began his love affair with food at the age of ten, selling soft pretzels from a three-wheeled bicycle cart he built with his father called “The Awesome Pretzel Cart.” After selling pretzels and washing dishes for six years, Guy earned enough money to pursue his dream of studying abroad as an exchange student in Chantilly, France. There he gained a profound appreciation for international cuisine that further strengthened his passion for food. He returned to the U.S. and graduated from the University of Nevada Las Vegas with a degree in Hospitality Management. 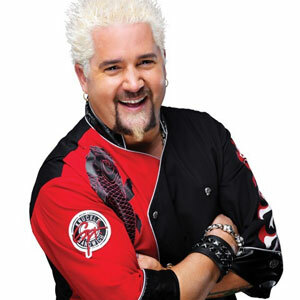 In 2006, Guy won the second season of “Food Network Star” and was awarded a six-episode commitment for his own show, “Guy’s Big Bite.” Since that time, Guy has created a thriving culinary empire as the host of top-rated TV shows including the Emmy-nominated “Diners, Drive-Ins and Dives,” “Guy’s Grocery Games,” “Guy’s Family Road Trip,” and most recently, “Guy’s Big Project” and “Guy’s Ranch Kitchen.” In addition, he has opened over 63 restaurants around the world and at sea, from the Las Vegas strip to the Atlantic City boardwalk; from South Africa and Dubai; as well as authored six best-selling cookbooks. In 2013, Guy fulfilled a personal passion with the launch of Hunt & Ryde Winery in Sonoma County, named for his two sons, Hunter and Ryder. Admission to Disney California Adventure Park is required and is not included in the event price. Separate Theme Park admission is required. Check-in begins at 5:30 PM at the Palisades Stage. Ticketed Event Guests will receive one alcoholic or non-alcoholic specialty beverage. Additional beverages will be available for purchase. Guests ages 21 and older must present a valid photo ID to be served an alcoholic beverage. Ticketed Guests will be seated for the live presentation. Shared tables in the Paradise Garden Grill area offered during the reception following the show. Due to the unique nature of this event, we may be unable to accommodate allergies or food preferences. Space is limited. Subject to restrictions and change or cancellation without notice. Once booked, there are no cancellations, exchanges or refunds. Event elements and information, including presenters, schedules, pricing, menus, and hours are subject to change or cancellation without notice. Disney California Adventure Park: Paradise Gardens Park 1313 S. Harbor Blvd.